In response to the recent posts about inactivty, lack of progress and such, I thought I'd make this thread explaining what I've done over the last couple of days, and trying to get some design feedback on it, I don't want to mess with other people's projects, but as most of the time I spend on the server is alone (usually because of time zones) I felt it better to start building some stuff instead of sitting around for hours trying to get agreement from others. The Two things I've done over the last two days are build a gate type thing between the entrance hall and the dome and improve the dias in the throne room. The gate has been decorated with some gold ore, and I've put wool blocks where I think diamond blocks should go, I figure it's quite an important tunnel, and deserves the opulance. The one problem with it is that it blocks the entrance to the minecart station nearby, I've built some temporary entrances to it, but while we're redesigning the station, we need to either put in a new entrance, move the station slightly, or remove my inconvenient pillar. The throne room dias I made slightly stick out in the middle, I also built proper steps to the throne and finished off the rest of the steps. I had an idea to put the throne on a slightly raised platform, but to do this would require raising the whole platform by a 1/2 block, then putting the throne on a platform half a block higher (1 block in total) then the currrent throne. I was also going to build smaller chairs along it for the dwarven king's councillers. The final idea I had for it was to build pillars against the back wall of our more unusual dwarven rares (wood and sandstone), as these are quite uncommon for our underground city, inbetween the pillars, we could also hang the paintings people have been talking about. Also, I've just updated the tunnel to the mines, would welcome opinions, also, does anyone know where is the silk touch pick is? I need to mine some coal to decorate it. I'd say go on and we'll see how it turns out, it seems nice so far. Bren spotted your dome entrance pillar and said he liked it and I don't mind it either. I like the steps to the throne but I have no clue what a dias is and didn't see anything different so I can't comment on that. For the mining tunnel I still suggest you try coal instead of iron, I don't quite like how it blends in against the planks. SW most likely has the silk touch pick. Gotta remind people to drop it when logging out. Sret, the 'Dias' is the podium, or the stage. Where the throne sits. Now, the pillar you made into the dome I really like. It works well. Splated is going to hate me, but I think we make the dome stop opposite the zombie spawner. I also believe we have enough diamond blocks. I like the idea for the pillars showcasing rare materials, but if the tiles goes ahead (designed by Spectrumwars) then we cannot make a sandstone one. My suggestions would be darkwood, sandstone, bricks? And maybe even one each for gold, iron, and diamond. Instead of making them 100% of that material, make it showcase that material. For example, have a stonebrick pillar, and in the middle have a panel of that material. I haven't seen what's done to the stage so far, but I can just make out the changes in the picture by Spectrumwars on the floor. I was thinking something like that, but wasn't sure how to do it. I like everything you did except for the sandstone and wood floors. They look good, but IMO are completely out of place. I suggest using darker and possibly stone counterparts for the floor. I made a small section of the floor furnace and stone brick to see what its like. It's not too bad. The floor was Spectrumwars... Can you take a screenshot so I can see please??? I keep mixing up who does what. Personally, I think the stone brick (and other similar patterned blocks) don't lend themselves well to being used as the smaller units in other repeating patterns, because they are designed to be used as the sole units of a large repeating pattern already. One whole brick and two half bricks look odd all alone without the other halves of each of the half bricks next to them. I've tiled most of the Throne Room floor with a wide variety of repeating patterns as a sort of flooring-and-tile factory showroom. Here's pics of what's currently on display, but I invite others to have a try at proposing alternative patterns. 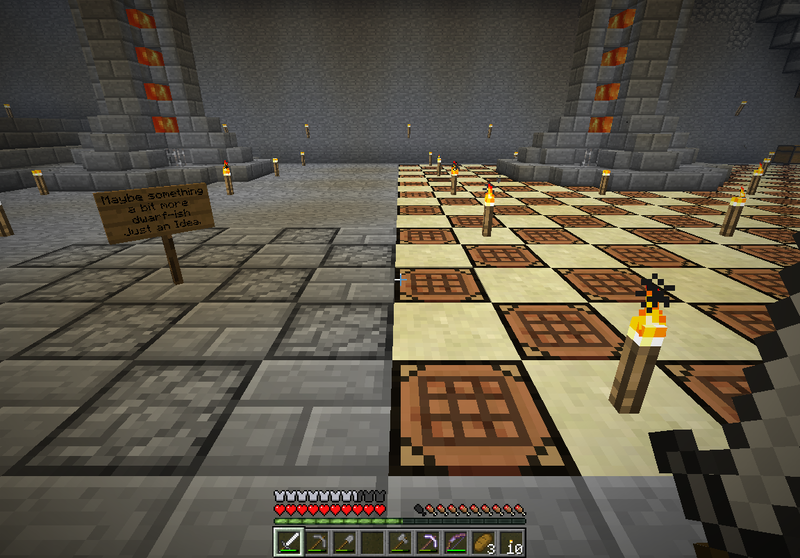 First off, here's four simple checkerboards using various mixes of furnaces, crafting tables, stone bricks, sandstone, and double-slabs. I used jackolanterns for the embedded lighting on those last two because torches just didn't seem to fit, and it's hard to reposition glowstone without wasting either glowstone dust or uses on an enchanted pick of some sort. We'd probably use glowstone on the final version if we choose to install this one. There's also many possibilities for using colored wool in various patterns, which I think was our original plan. There's definitely something I like about the slab/furnace pattern. I'm not sure I can see any of the others work, but it's hard to give a fair opinion without having a long look at it being installed in most of the room. I'm not entirely sure I like the idea of having furnaces in the floor. I'm not sure if its a pro or a con that we can hide items in them. But at the very least, it's a way to use up some of the godawful amount of cobble we have saved up. I actually think its almost time to make another storage room, just for cobble. Keep it really compact, and maximize storage for space. Don't make it just quite yet though. As to the hiding items in there, it is a possibility, however, why would anyone do it? If they wanted to screw with us, they could do it many other ways. But I'm hoping that no one wants to. We're all here for the same reason. And we can check the furnaces as we go past. Or check them every so often. Just make sure nobody smelts in them. Maybe we can pave our king's throne room with double slabs (made of 2 cobble each) and furnaces (made of 8 cobble each), then fill each furnace with 128 cobble on top of that! That adds up to a staggering average of 69 cubic meters of mined stone per square meter of floor. With regards to the cobblestone storage situation, I was going to dig a seprate tunnel in the storage room just for cobble, as for the floor, I'm going to log on in a bit, look at them in game, then give my opinion. I actually like the last design with the furnaces, sandstone, and slabs, but I dislike jack O lanterns because of their stem texture. If they were replaced with glowstone, I'd say its the best pattern so far. I've replaced almost half the floor with a new pattern I'm trying out. I think it works quite well, but I may want to reposition the stripes between 5x5 blocks...once we get finalized, I'll replace the jackolanterns with glowstone, or possibly some sort of recessed lighting under glass. I'd like to work more netherbrick or obsidian into the design, but we seem to have used up pretty much our entire supply on the portal room. And the one netherfortress we have a path to seems a tad small, and is too exposed and thus difficult to mine. Anyone up for a nether exploration trip to find a fortress that is both larger and more built into the landscape? On my old server we found one almost entirely embedded into a netherrack fomation, that was incredibly easy and safe to mine out almost entirely. I might give that a go later, If I can get Minecraft to work. I don't think the workbench edging works at all. It could be a good pattern if you find a block that works better. I've been trying to think of a good use for all the blocks and blocks of iron we've got. Was mostly thinking of using it up on the throne platform somehow. Making the actual throne out of iron blocks was the direction I was mostly headed in, although the Cobblestone throne works strangely well as it is.